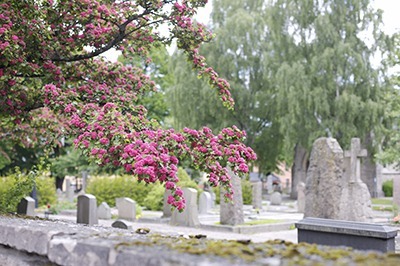 Catholic Cemeteries in the Fall River Diocese carry out the sacred duty of providing a dignified Christian burial for all of our beloved faithful departed. These cemeteries are extensions of our parishes. Just as the faithful have shared and celebrated in the community of the Church, so in death their bodies rest with other deceased members of this community, awaiting the day when God will raise their mortal bodies to glory. Our cemeteries are holy places of honor and respect for those who have died; they are places for prayer, reflection, hope and remembrance. The names and addresses of Catholic cemeteries in the Fall River Diocese follow below. In most cases, the office contact information is that of the parish of which the cemetery is part and the director is the pastor of the parish. Reverend John J. Perry serves as Diocesan Director of Cemeteries. He may be contacted through the Notre Dame Cemetery Office, 1540 Stafford Road, Fall River, MA 02721, Tel. 508-673-1561 or by FAX 508-673-5355. Location and Office: 1540 Stafford Rd. Location and Office: 2233 Robeson St. Location: Grove and Pine Sts.